Realism: Whether it’s a scary demon or a horrific car crash, does the makeup look realistic in nature? Theme: Does your makeup follow the theme of Gore? Difficulty: Did the artist use more difficult techniques in their makeup application such as prosthetics, a bald cap, or hand-laid hair in their design? Originality: Did the artist create an original look and design for their Gore makeup? Final Look: Was the final look of the Gore makeup enhanced with the use of background, props, costumes, etc..? Comments: This was a wonderful gore entry! The makeup was very well done and it had the proper amount of blood for such a horrific injury! I would have liked to have seen use of an actual prosthetic piece or staying with just one type of prosthetic material like gelatin or Third Degree silicone material to create the wound. The use of actual fake teeth would have been a realistic touch as well. Those elements would have pushed this entry right into the winners spot. Excellent job, Hannah! Comments: This was such a great entry, and in my opinion a tie for second place! The makeup was extremely well done and the use of the Monster Energy drink can was a nice touch to fit in with the back story for the makeup. The one thing that would have pushed this makeup into the winners spot was for the area around the can a much smaller gap between the edge of the skin and the can itself, in line with the look of real life impalements. Excellent makeup and execution Rebecca! Comments:The makeup applied for this domestic violence victim looks like something right off of Law and Order: SVU, and in my opinion a tie for second place! Simply fantastic! The bruising is beyond realistic, the prosthetic is applied perfectly and the attention to detail with the smudged/running makeup from crying is beyond exceptional! The one element that would have pushed this makeup into the winners spot was a touch more Gore. Amazing job Phoebe! You should be very proud of your entry! Comments: This makeup was the goriest entry by far and probably the most difficult as far as multiple prosthetic application…excellent job! The one thing that would have pushed this makeup into the winners spot would be less visible edges around all the prosthetics…as well as a fresh blood look for the final photo. That blood would be practically oozing out of those wounds 😉 Excellent work, Torrey! Comments: This was a fantastic entry! 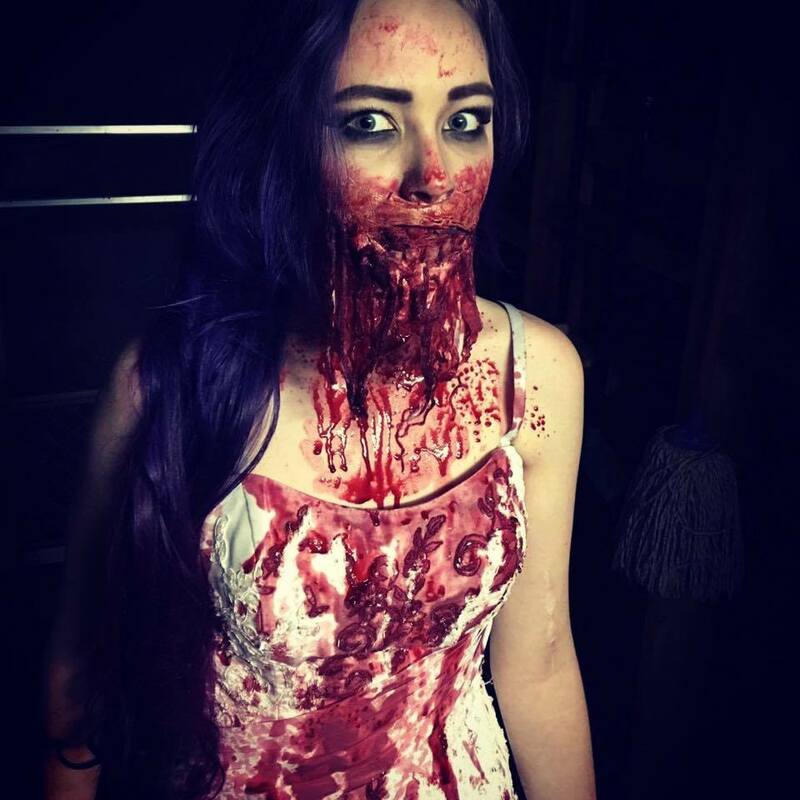 Without a doubt, a very well executed, realistic makeup that could walk out onto a set. The back story sent in with this entry took this makeup over the top. The detail put in to this acid burn was amazing…right down to the top corner of the upper lip being distorted from the acid burn. I also loved the white fleshiness added to the chemical burn area. The addition of the final pictures setting, which perfectly worked with the back story, was a brilliant touch. 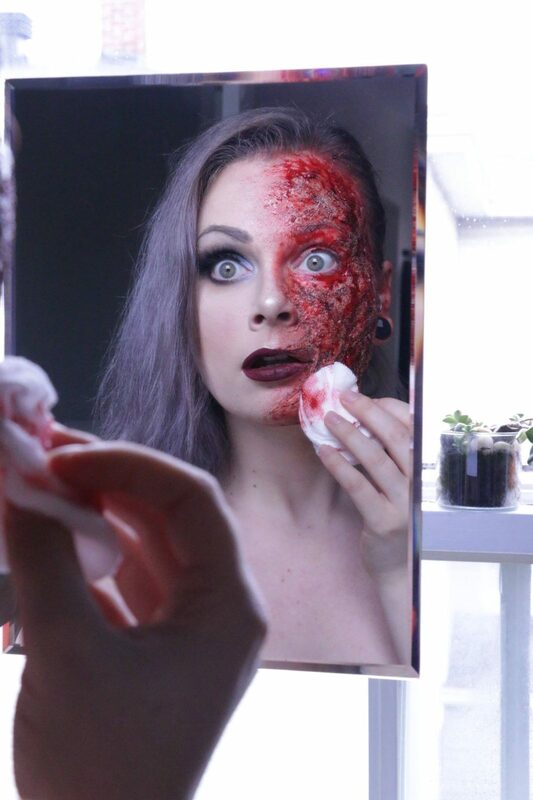 Congratulations Anne-Frederique for winning the 2016 QC Halloween Contest with your realistic acid burn makeup. Thank you to all the artists who submitted entries for the contest! And to the 5 finalists, you should all be very proud of your work. Have a Happy Halloween everyone and once again, congratulations Anne-Frederique for winning the 2016 QC Halloween Contest, Gore category!